Along the Rhine in the mid-19th century were a number of casinos, attractive to many people including French and Russian nobility as well as a few English, German, Polish and other people with money – and a few hangers-on without. The widowed General and his entourage including his actress girlfriend, his young children and their tutor, his stepdaughter and her suitors have been gambling a bit but are really waiting for the old grandma in Moscow to die so they can be rich and marry whomever it is they want. But grandma doesn’t die, rather she shows up at the casinos and over-indulges at the tables herself. Now what? The tutor, Alexei, is the 1st person protagonist barely attached to the family, but he is in love with the step-daughter, will do anything for her, and he’s good friends with the rich but untitled Englishman who apparently has enough money to interest the stepdaughter on some level. 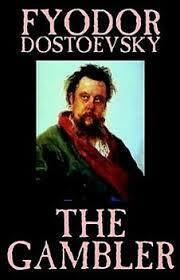 Supposedly Dostoevsky’s portrait of a gambling addiction is as good as they get. Your comment at the end about forsooth made me laugh because my nephew and I were just talking about various words and forsooth was one of them. I was thinking it was possibly in every Shakespeare play I ever read, lol. LOL! I’ve not read a lot of Shakespeare – I only remember some cartoon character from my childhood saying it. “Forsooth!” Was it Bullwinkle? Can’t answer about Bullwinkle. Heard of it, but don’t think I ever watched. It came after my tender years.